Its permission given by a country to a passport holder to enter stay, or leave a country for a specified time.Visa can be for different purpose Student visa, Travel visa, Work visa ... etc. It is Long term visa for a stay over 90 and up to 365 days in Poland. It should be noted that the national visa allows to stay in other Schengen countries for up to 90 days within the period of 180 days. The national visa is usually granted as multiple entry visa. Each visa requires certain set of documents needs to be submitted for verification.below are the details given for Student visa.Below is the procedure in India but we are sure it will be same for all the nations, with very little differences. Valid passport (issued within the last 10 years and with at least 3 months validity after the scheduled return), with at least two empty pages. Application form duly signed, with 3 passport photographs according to biometric specifications, not older than 6 months. Covering letter from applicant explaining the exact purpose and duration of stay. Proof of other academic qualifications (diploma, academic degree certificate or mark sheets duly attested by means of the Apostille certification). Proof of financial means to cover the costs of the stay in Poland during the stay (Blocked amount) . Photocopy of data sheet (first and last page) of your passport. Confirmation certificate for payment of Consulate fees. Book your Visa Appointment at e- Konsulate page.Select your nearest Poland embassy under 'Appointments for student visa'. Note the Poland embassy issues vacant seats on 10th and 30th of every month so keep on checking on these days. Try on mondays and Tuesdays aswell you have pretty much chance of getting an appointment. Select your country or region and Diplomatic mission. Check if your country have poland Embassy.If not search where you can apply. Bangladesh students must choose Delhi embassy India. Book an appointment online on the available date and time slot. (just select the available and suitable time slot for you, if something goes wrong, you will have the option to cancel the appointment).Finding it difficult to book a slot, let us do it for you. After filling up the details website redirects to its registration page.First you need to fill the registration form for national visa. Complete your registration by providing all the required details.note fill your personal details as given in passport or any ID card issued by your country. 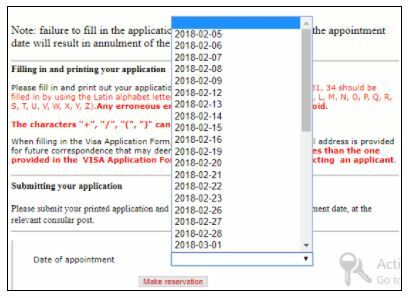 Revarify each and every column you have filled then save and submit the registration form print out the filled registration form.note down form number.You should get an email from the embassy confirming your appointment. Take a print out of this appointment mail. Also, get two (attested) copies of all the required documents. Prepare for interview questions. Click here for interview questions. On the day of document varification carry all the documents with a photocopy duely attested.Arrive at the Poland Embassy 30 minutes early to your scheduled time. If a slot is empty, you will be pushed to an earlier slot. Pay Varification fees in the bank located in consulate. Consulate General of the Republic of Poland in Mumbai by demand draft at the Abu Dhabi Commercial Bank ( address: 75, Rehment Manzil, Veer Nariman Point, Churchgate, Mumbai-400020) timings 10:00 to 16:00.Get payment reciept. A security guard will verify your Appointment letter, Demand draft amount, and your passport and let you inside. Now at the entrance of waiting area, you will have a security check-up. You will be asked to take out all required documents and hand over your bag. You will be given an order list and will be asked to write your name, passport no., and mobile no. behind the DD (carry a pen!). Now you move to a queue in the waiting area. Arrange all your originals and 2 photocopies of documents in order given in order list. When your number comes, you've to go to the counter and give them DD, DD forms, Passport along with 1 photo. He/she may then wish to see your other documents. After this, you'll be provided with a token no. for Visa interview. ext, your fingerprints will be added to the database. Follow the instructions given by the interviewer. It usually takes about 2-3 weeks to process your Visa application. After that, you will get a mail from the consulate asking for you to come and collect your Visa and other documents. Just go and collect the documents at the on the given date and time. Verify whether the information printed on the visa sticker is correct and complete and to report any errors to the Embassy immediately. The date format is always YYYY-MM-DD, eg. 2010-04-14 (14th April 2010). Number of travel document means the serial number of your travel document such as passport number. All fields must be completed. In case there is no postal code, fill in with "0". For "phone area code" fill in without "00" or "+". For instance, in case of India the area code is "91", for Poland the area code is "48"
Photograph should be taken within last 6 months for easy identification. Your face should cover 70-80% of the photograph. you should face camera directly, looking ahead with open eyes, natural face expression and closed mouth. You cannot wear a hat or any other head covering. your hair must not cover any part of the face. In case an you wear glasses: The glasses should not be sunglasses or dimmed glasses. The frames should not cover any part of your eyes. The glasses should not produce any light reflexes. In case you wear head covering required by you religion: The covering should not cover any part of face. The photo must show the full head and the upper part of the neck, the right and left side of the face must be clearly visible. Where can i check whether my country has poland consulate or not?? Goto to e-consulate and search for your country in drop down menu, If you country not listed in dropdown menu Simplest way is to google “ Poland consulate in “country” “ then the results show up to which countries consulate you need to apply. My country has two visa consulate which one should I choose? Yes some of the countries have two or more consulates some have none. To know which consulate fall into your region goto information link of poland embassy. Ex- India has consulates in two region Mumbai and Delhi. Go to Mumbai embassy information page and look for your state. A few weeks after your Visa Interview, you will get an email saying your passport is ready for collection. Once you get this notice from embassy, visit the consulate and collect your passport.You can check your status here for Mumbai. Here for Delhi. for other nation Poland embassy website of your country search for VISA DECISION STATUS. To cover your expenses throughout your stay in foreign country you need to posses or lock certain amount of money in the bank.By this government of the foreign country is sure that you have enough money to survive in the their country for certain period.It’s a mandatory requirement for visa application. I am not getting any slots!! Yes we understand the frustration in booking the slots.